Mending a dripping tap is something that can take less than five minutes if you have the right tools and some replacement valves or washers. It’s not that hard at all – just remember to cut off the water supply before beginning. One of the hesitancies in tackling taps is the fear of not having running water at all or creating a flood, but the only thing to fear is fear itself. The ‘how to’ can depend on the type of tap, but in general should not be a serious job. If the heat is not the same at the top and the bottom of your radiator(s), then you probably have air collecting at the top and they need bleeding. It’s a routine and minor maintenance issue that every man, woman and pet should know how to do. All you need is the radiator key and a cloth to catch any drips. Why call in a specialist to do the plumbing equivalent of tying your shoes? Loosen the screw until water comes out, then tighten. Just be careful not to burn yourself! “Red is hot, blue is not, green and yellow earth the lot.” In the good old days, you had to know which were the earth, live and neutral wires in a plug, and there were lots of different ways to remember which was which. No one wants to advocate playing around with electrics these days. While sensible from a safety point of view, the great British tinkering culture has taken a real knock. We’re all worse off for it, too! Have you ever screwed something into the wall, only to have it slowly and annoyingly sag and then eventually fall right off the wall? Bookshelves are the typical example of this, partly because they end up carrying so much weight. It’s easy enough to place your bookshelf on the wall, get it level and draw circles where the screws go. The real trick is getting the fixings right, based on the type of wall you have. With a brick wall, you need wall plugs – and good ones. You need to drill deep with a hammer drill and make sure the hole is the right size. Tape an envelope to the wall just underneath the hole to catch all the dust. If you’ve hit loose mortar or plaster, fill the hole and move the shelf somewhere else; if the wall isn’t solid, the bookshelf won’t be either. The plug should be snug and tapped in lightly with a hammer, and make sure the screws are long enough to go all the way into the plugs. 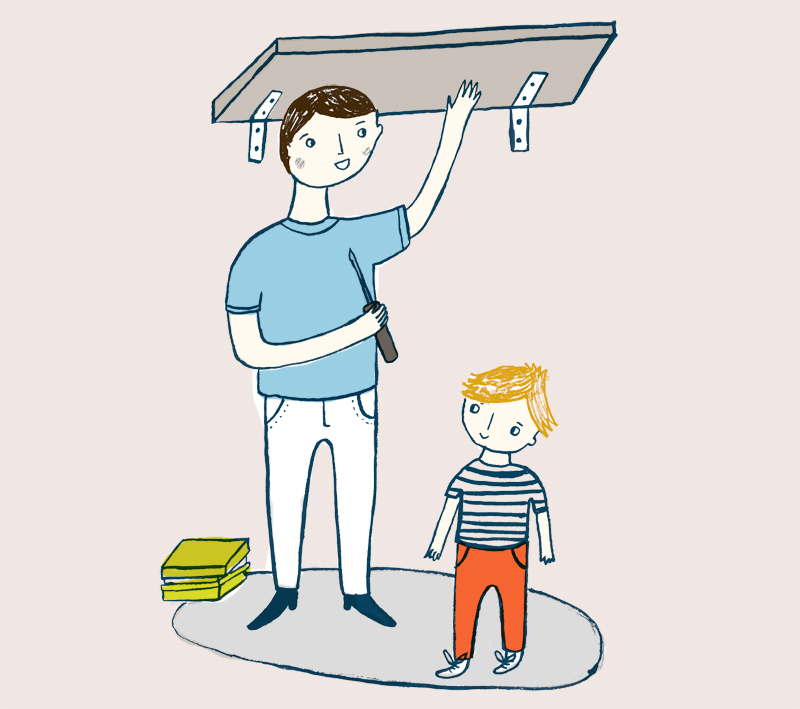 There are a few steps so plan on taking up to 30 minutes to do the job, but overall, putting up a bookshelf is a straightforward DIY job that you can teach to your children. Another activity that’s changed over time is replacing fuse wires in the fuse box of a property. This could be a tricky process that involved inserting fuse wire through a small cylinder, and tying up the ends around tiny screws. Nowadays, modern consumer units remove the need for this, and if simply tripped means the homeowner can turn the relevant switch from off to on. It’s another item in the house that is neatly boxed up and is not exposed (not literally) to the homeowner, meaning less is understood about the process. Using electric drills as a screwdriver mostly just ends up stripping the head and making it impossible to remove. You’re really in for it if you ever have to take it out again. What happened to the good old fashioned screw driver and a bit of elbow grease? Much less painful in the long run! It’s one of those situations where you might not need to know this until it becomes a problem, but knowing this beforehand can make things so much easier in an emergency. Stopping the water coming into a property shouldn’t be a common occurrence, but if you needed to immediately stop the water flow (let’s say in a flat where could cause flooding to the flat below), would you know what to do? We haven’t convinced you to brush up on your DIY? Post your job and our tradesmen will still be happy to help!